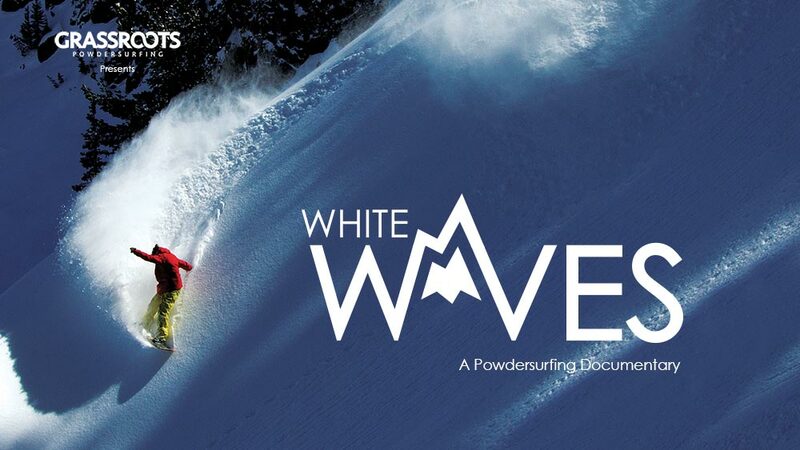 A documentary film about the history, contemporary and future of true binding-free powdersurfing. A story on bindingless riding just dropped in Canada’s finest snowboard magazine and we were kindly included in the run down of various board options. We are hyped that Snowboard Canada would be willing to work with us and spend a few days in the backcountry gathering images and memories. We had a blast up there and can’t wait to get back up there for more. The article gave a run-down of a few board options that exist out there and stated a few characteristics of each brand. As with any media, things often get confused or missed in communication. We were labelled as the “skate – style” company which we suppose was fair because we make sure that our boards are the least restrictive and are designed to allow the rider to fully take advantage of not having the board attached. They also ollie better and are more agile and controllable than anything out there and that goes a long way. What was not mentioned is how they handled any and all conditions we threw at them. When all the other boards were either unrideable in the conditions or forcing the rider to grab that dreadful rope for control, our boards were still ruling those conditions. Fully hands free and truly binding free. And that certainly deserved mention. They also produce a unique ride and feel that is much different from your typical snowboard.. much more surf-like (more so than Skate-like) and very agile.. something we are very proud of and something that has taken years of R&D to accomplish. We were a little bummed to be labeled as just the “skater dudes” here, as that is just a small part of what we are about.. but stoked to be included and honored to go powsurfing with Canadian legends that I spent my childhood idolizing. Watch the video below that was made from the first 4 days of our trip.. and see what our boards are all about! 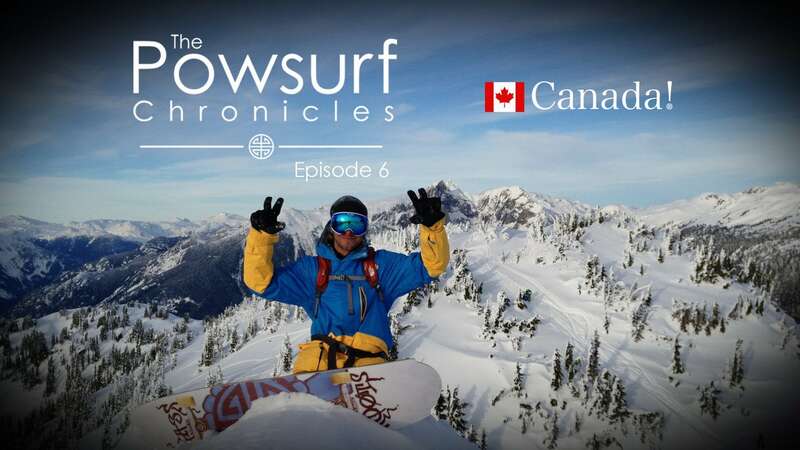 The Powsurf Chronicles Ep 6 – Canada! from Grassroots Powdersurfing on Vimeo. I hate to be picky.. but the quote used in the article was very misleading.. It was taken from two quotes, and mixed together out of context, missing the entire point I was trying to get across. I spoke about how I originally started by just taking the bindings off of snowboards to see if it was possible to ride without bindings. What they left out were my words about how snowboards don’t make good bindingless boards! and they don’t perform well unless it is knee deep blower pow! (this is why so many noboarders use the rope) This is the whole reason why we started shaping my own and also the reason that our boards look and ride nothing like traditional snowboards. We wanted something that had precision control in varying conditions and allowed the freedom to ollie, spin and flip the board, and have really good control in a variety of conditions. Snowboard shape and construction did not allow for this and that is why Grassroots powsurfers are built and designed the way they are. We pride ourselves in offering a variety of shapes to accomodate riders of any size and style. They are so incredibly “surfy” and fun.. much different than a snowboard feel. We have spent years perfecting them so it’s a bummer when we get labelled so narrowly as simply “the skate style” guys in the article. All you have to do is watch any of our films and see the boards in action and it’s clear that skate-style riding is only a fraction of what our boards excel at. But on that same note.. skateboarding is the most technically difficult sport on the planet and has progressed leaps and bounds beyond anyone’s wildest expectations.. We hope to do the same for powsurfing. Snowboard Canada deserves a HUGE thanks for the article and efforts. Jeff Patterson and Rob Stevens were instrumental in bringing all these riders together and making these 4 days some of the best days of the season. Cheers amigos!! See you again soon. Our trip to Canada was a blast.. one of the funnest trips of my life. The film in this article is just 4 days of riding and there is so much more to see! We will release more footage as time permits from the rest of the trip. Jeremy Jensen – Mid pillow line. 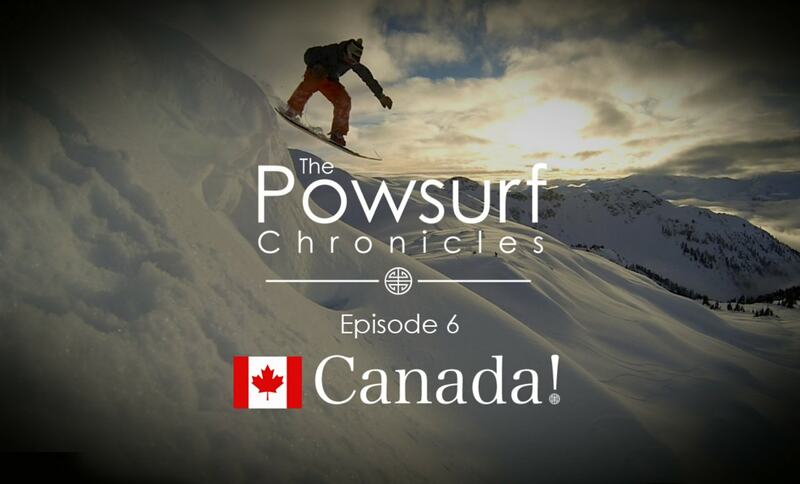 Powsurf Chronicles Episode 6 – Canada! Grassroots riders Jeremy Jensen and Scotty Arnold take a trip up north to powsurf with a handful of Canadian rippers. 4 days of sunshine and dry powder conditions in the Coastal mountains of British Columbia had stoke levels high as ever. Most of our Canadian friends were riding Grassroots Powsurfers for the first time and seeing the stoke and the smiles on their faces at the bottom of every run made the trip that much better. Riders: DCP, Kevin Sansalone, Alex Warburton, Justin Lamoureux, Rob Stevens, Scott Gaffney, Scotty Arnold, and Jeremy Jensen. 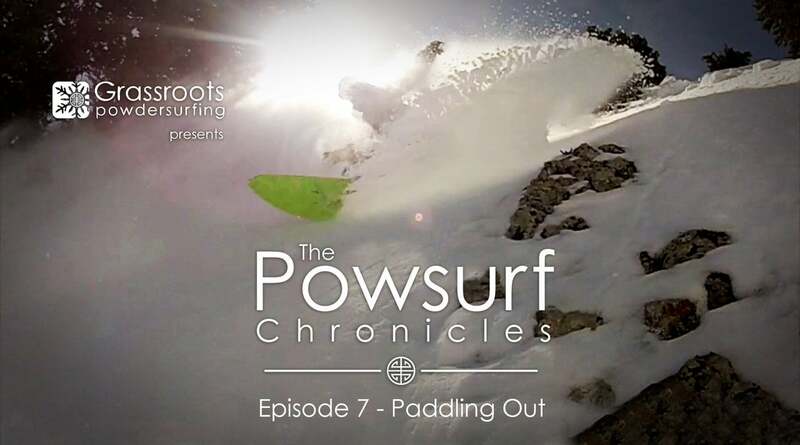 https://www.powsurf.com/wp-content/uploads/2013/11/powsurf-chronicles-episode-6-canada.jpg 775 1280 jeremyjensen https://www.powsurf.com/wp-content/uploads/2018/09/DropLogo_Horizontal_340x156-300x138.png jeremyjensen2013-11-29 02:35:462014-01-22 18:03:20Powsurf Chronicles Episode 6 - Canada! Season’s Greetings! 2013-14 Season Opener. It seems we had to wait longer than ever before to get a taste of powder this year but as always it’s well worth the wait. It was mid November when finally a couple of feet blanketed our special zone that we have re-visited for the past 25 years. I learned to snowboard here nearly 25 years, I learned to powsurf here 14 years ago and it just never gets old. So many nooks and crannies that hold special memories and continue to dish out great memories on every visit. Welcome winter!! Whippin’ through head high weeds! Even 5 inches on dirt is enough to surf when you get the type of floatation that a Grassroots Powsurfer provides. Weed Wackin’! RC and I made multiple laps this day, making shallow slalom skateboard-like turns so we didn’t scrape bottom. So fun watching weeds explode before our eyes and challenging to control speed without taking any speed scrub turns. Riding 5″ on dirt was a bit of a tease but fun nonetheless. 2 weeks later we got a real dump with 2 new feet to fill things in so we could really slash the pow. Still a bit thin for coverage but it’s amazing how much fun you can squeeze out of just a little bit of snow. That’s part of the magic of powsurfing. Brandon and Jeremy soaking in the sun and taking in the familiar view. 14 years ago Brandon Saunders and I brought up an old Winterstick Round Tail plus to this very zone for some of our first big binding free runs. We were amazed that it was possible to link turns and so full of stoke and thoughts about the future and how we could make a board that would work even better. It was great to re-unite with Brandon and get him back on snow again. This time on powsurfers designed and shaped for this very thing.. Brandon was so hyped and amazed with riding boards that were designed for this very purpose. Welcome back Brandon! This was Brandon’s first binding free powturn in 14 years. Welcome back brother. Brandon getting pitted in the woods! Dodging stumps, fallen trees, logs and rocks in the tight woods..scary but so much fun! That smile says it all. What would an early season at the “sacred grove” be without a little fun in the campground? We finished off hot pow laps with some pole jammin for desert. Pole Jam on the Grassroots Phish Swallow tail. https://www.powsurf.com/wp-content/uploads/2013/11/Brandon_low-NOV2.jpg 1254 1672 jeremyjensen https://www.powsurf.com/wp-content/uploads/2018/09/DropLogo_Horizontal_340x156-300x138.png jeremyjensen2013-11-24 19:01:282015-09-16 05:53:41Season's Greetings! 2013-14 Season Opener. Stoked to give you a glimpse into this season’s Chronicles. ENJOY! 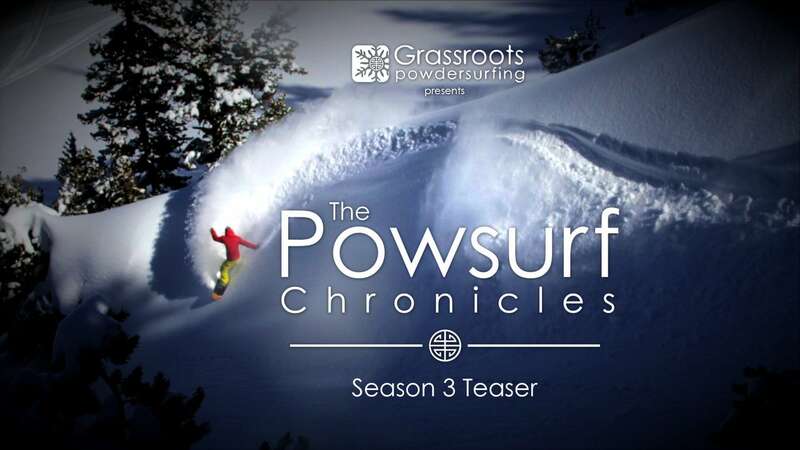 The Powsurf Chronicles Season 3 TEASER from Grassroots Powdersurfing on Vimeo. Here’s a quick tease of what’s to come in this season’s Powsurf Chronicles short films. Grassroots Powdersurfing was founded in 2007 to create a pure, binding-free powder-riding experience. Drawing inspiration from skateboarding, surfing, and snowboarding, we designed & handcrafted boards that enabled a new style of creativity, self expression and progression. We’ve spent the past 7 years pushing the boundaries of what is possible on our powsurfers and loving every second of it. 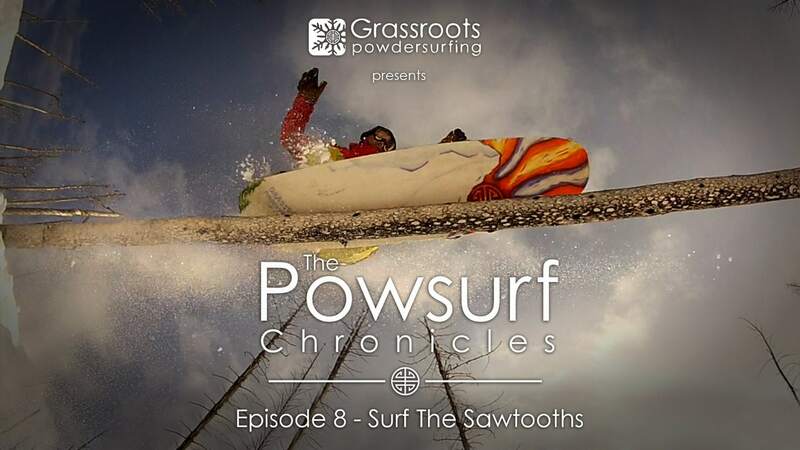 The Powsurf Chronicles films offer a glimpse of what powsurfing is all about and focuses on the best things in life; people, places, and powder. Stay tuned for episodes dropping this winter. Visit us at www.powsurf.com to learn more and pick out the right board for you. Many of these babies were actually handcrafted over a year ago and they were just too beautiful to let go. I am a bit of a hoarder when it comes to powsurfers, my house and walls are littered with them. It drives my wife absolutely crazy. Fortunately she sees the long hours and sleepless nights that I pour into this passion and she recognizes the unstoppable drive I have to get outside and rip as much pow as humanly possible. It obviously makes me happy and it is part of who I am so she puts up with it. Sometimes I feel that I get carried away with designing and building things to be as functional as possible; ptex bases, fully gripped topsheets with deep concave, shapes based on performance rather than just aesthetics, etc. I want the boards I make to ride as good as possible, or else the experience is compromised. I feel the experience is really what it is all about, more so than how “cool” the board looks. I work to blend the two, but often times my mind chooses function over fashion. So I decided to take a break from my normal attitude and focus on making something beautiful as priority one, but still make it ride great so as not to disappoint the rider. They may not be as fast and as durable as our ptex based boards but they are gorgeous.. so much so that you may not even want to ride them for fear of scratching them. 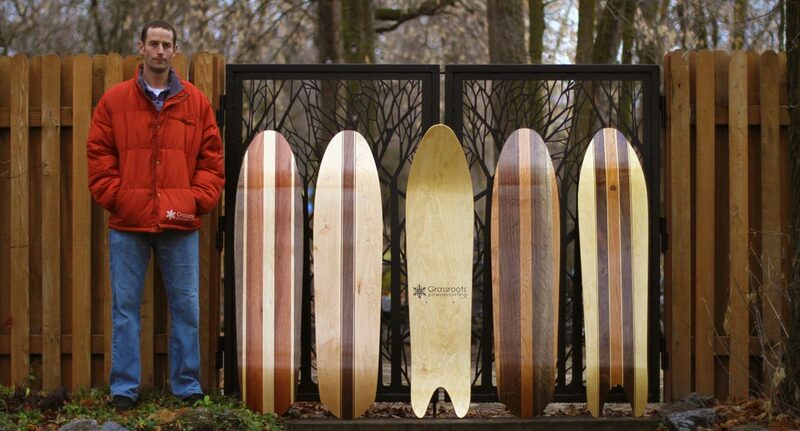 Whether they end up on your wall or under your feet, these boards will certainly turn heads and put smiles on faces.